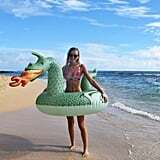 These Fire and Ice Dragon Pool Floats Are About to Make Summer Scream "Dracarys"
Picture this: it's mid-Summer and season eight of Game of Thrones has already finished. By then we know who inherits the throne, what goes down in Winterfell for the biggest battle sequence to date, and who the hell Arya is running from in the intense trailer. There's officially nothing left to theorize about, and we probably won't be able to stop talking about those wild six episodes, so what do we do? 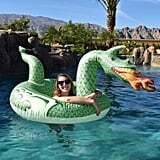 We throw a Game of Thrones pool party and have our own battle! 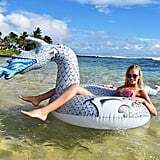 Thanks to the GoFloats Fire Dragon Party Tube ($20), which also comes in an Ice Dragon version ($20), our Thrones-inspired party is complete. Except in our version of Westeros, there are tons of dragons, and the only blood involved is tomato juice in the Bloody Marys. 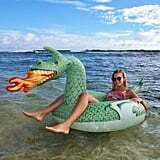 Shop Amazon's dragon pool floats ahead, and get ready to scream "Dracarys!" all Summer long.